This report covers the week ending August 20, 2017, and includes a summary of the previous month’s weekly sales. The Mint had no new releases during this sales period, and no earlier items have been newly added to the report. The top-selling Mint product this week was the 2017 Proof Set (17RG), which sold 6,375 units. In second place was the 2017 Uncirculated Set (17RJ), with 4,943 sold. 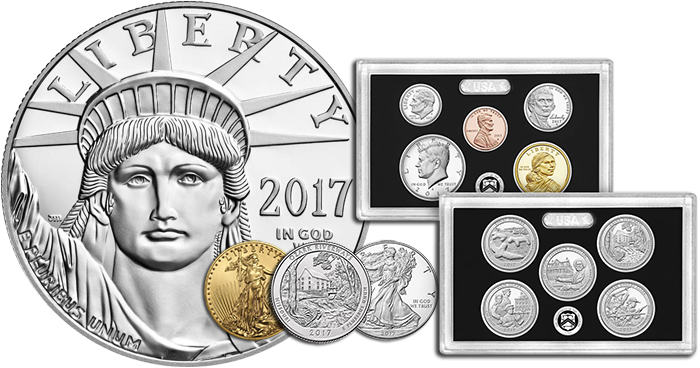 It was followed by the 2017 Silver Proof Set (17RH), selling 3,547 units; the 2017 American Eagle 1-ounce silver Proof coin (17EA), with 1,917 units; and the 2017 America the Beautiful Quarters Proof Set (17AP), with 1,305 units. The 225th Anniversary Enhanced Uncirculated Set (17XC), released August 1, nets a negative figure for the first time this week: -12,037. The 2017 American Eagle platinum Proof coin (17EJ), released July 6, had a net negative figure of -181. Limited to a mintage of 10,000, the 2017 APE Proof is nearing sold-out status, with 31 remaining as of August 22. There were no other significant downward adjustments on the report. The Mint’s next release will be the rolls and bags of 2017 America the Beautiful–Ellis Island quarters on August 28. The third edition of MEGA RED has 1,504 pages, 8,200 listings, 7,000 images, 15,400 auction records, and more! Click this link to order.